In the field of marketing, there are lots of words that people know but can’t explain. One of them is benchmarking. And today we’re going to not only explain it to you, but also show you how important it is for every brand’s social media performance. Benchmarking has quite a few definitions, but the most succinct one is this: “A process of studying industry or competitive practices, functions, and products and finding ways to meet, improve upon them or discover what is the best performance being achieved”. Benchmarking done right will help you offer better marketing solutions, create a better marketing strategy that leads to an increased ROI or other key factors important for your business. In social media, effective benchmarking will help you see your mistakes and finally overtake your competitors. It might take some time, but it’s worth it. Why should your brand get into benchmarking? Benchmarking shows you where you stand and what to do to assure your future growth. By assessing the current state of the company, you’ll become aware of the right steps to take… and which to avoid. Keep an eye on your competitors and see how you’re doing compared to them. Without benchmarking, it’s simply not possible – you won’t know your position on the market. Compare your marketing efforts and see the pros and cons – maybe something doesn’t work how you intended. 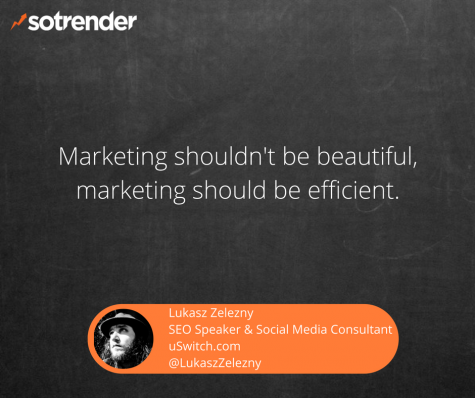 For example, your dedicated content might be less successful than user generated content. Know your audience better. By benchmarking, you familiarize yourself with your own audience as well as the target group that follows your competitors. There’s no need to hijack their followers, but if your strategy is successful they’ll likely come to you on their own. Focus on the best practices in your industry and see what works and what doesn’t. Competitive benchmarking is a must if you want to stand out from the crowd. Otherwise you’ll just repeat the same old things, doing nothing extraordinary – and then you’ll be observing your competitors with tears in your eyes. Proper benchmarking requires a lot of time and effort, but it’s worth every second! We are fully aware that it may be a bit of a struggle in the beginning, so you can use our hints below to fully plan out your benchmarking. Analyse the current state of your company. What did you you achieve and what could have been done better? Where do you stand as a brand? These details will be helpful in the next few steps. The more precise your answers are, the less questions and doubts you’ll have later. Set up a plan. Establish the goals you want to achieve through effective benchmarking and the metrics you’ll use. Choose KPI’s and essential statistics you want to focus on. Reach? Number of comments? Engagement rate or number of retweets? It’s up to you. Collect important data and get access to helpful tools that measure your marketing efforts. We mentioned some of them in one of our previous blog posts, and you’re welcome to use Sotrender too 🙂 Based on generated reports and analytics, you can make conclusions on how to proceed. Compare your company to others, taking every possible factor into consideration. Sometimes the little things make a huge difference. For instance, you might notice a 5% engagement rate growth. Doesn’t it sound great? But what if your competitors noticed growth too, but by 20-30%? You need to find out why and look at your strategy from a different perspective. After establishing what and how to benchmark, go further with implementation, updates, and improvements… just start doing it, one step at a time. Don’t forget to check your results and compare yourself to others. You can do it manually by observing the steps of your competitors on social media. This method is limited, as you don’t have access to brand/agency accounts, so you can’t get all of the necessary information. Sotrender is here to save the day though – we offer analytics for accounts you aren’t involved in. 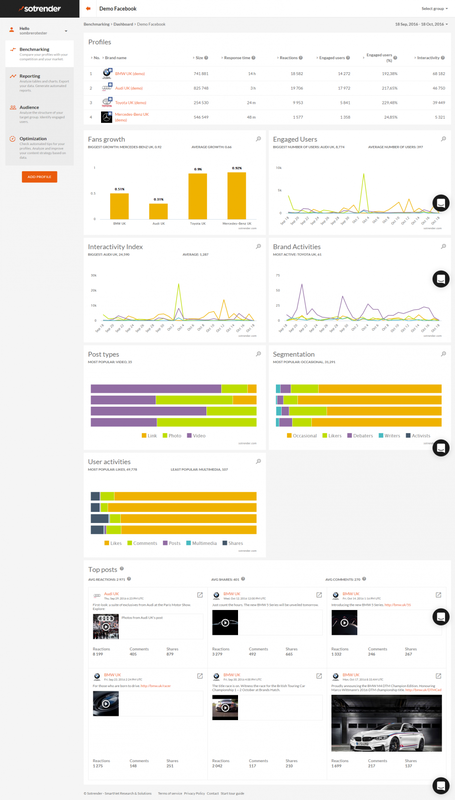 Track your growth metrics by checking e.g. Google Analytics and Facebook Insights. Just keep in mind that the data might not be exact. Use external tools that, when used together, will work wonders and help you achieve your business goals – you can find a list of tools HERE. Observe trends in the industry and react to them – HERE you’ll find some useful tips for watching trends. Here in Sotrender, we know how to benchmark against your competitors on social media. Our detailed analytics will take care of your own profiles first, and after providing you with valuable info, you can put it into a ‘benchmarking group’. Simply choose some profiles from our user panel and make a group that reveals lots of brand secrets, as you can see on the screens below. Stay up-to-date with your competitors on social media. You’ll never know everything, but you’ll know more than you thought you would. Get data you can’t get by observing profiles on your own. Sotrender allows you to see metrics that are hidden on page if you don’t have any role on it. Compare your competitors in groups with up to 8 profiles or page vs page. Analyse the most important metrics in the eyes of your brand. See where you stand out and in which areas you need to work on. For example, you might be flourishing with your content, but it’s distribution may be poorly managed, resulting in lower reach. Reach your audience or similar ones better. Benchmarking shows the strengths and weaknesses of other brands and you can only make the most of it. Or leave it alone and cry yourself to sleep. You can do a lot of things on your own and you probably look at your competitors from time to time even now – which is a form of benchmarking! But by using tools, committing some time, and taking the initiative, you can do it better and more precisely. Your strategy will thank you for it. Do you benchmark? Share your stories!